The other day I was wearing some vintage riding shoes I had picked up at my local second hand store...it got me thinking that perhaps I no longer remember what it feels like to purchase or have a brand new pair of shoes on my feet? Maybe all my shoes are a little too big? a little too worn in? a little too roughed up? Have I forgotten what a new shoe should feel like? Am I addicted to buying vintage shoes? They're already worn in. No hard work for me,. No guessing game if they're going to be a good pair of shoes, sturdy and dependable after a few wears. But the question still nagged me...maybe my feet don't remember what it's like to have a pair of shoes that really fit them? Maybe I should try purchasing a new pair of shoes, like these ones that a friend sent me. We Who See Pinstrip boots. 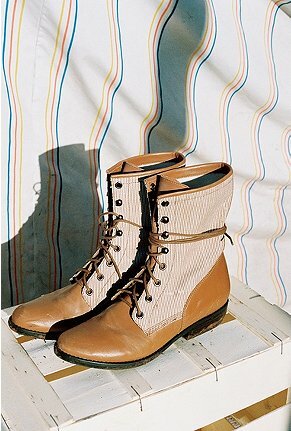 J'adore these boots from Urban Outfitters. So here I was thinking maybe I should purchase some new shoes, but then I came across these fun facts, "Choosing new-to-you leather shoes saves more energy than an average household uses in a day." Well the amount of new-to-me vintage shoes that I have on my shoe rack, means I have saved a lot of households energy. I once got out at a game of "never have I ever" because a friend of mine had never bought vintage shoes, so she named off that...well of course I had to put a finger down, since 90% of my shoes are vintage. Another fun fact that I came across,"Choosing a previously owned leather clutch saves as much energy as not watching TV for 3 days straight." Well great, previously used purses are more fun to hunt for anyways! AND no one else will have your bag! so win win! "Buying a pre-loved silk dress saves 95% of the CO2 needed to make a new one." Perfect, keep breathing easy ladies, keep shopping vintage! So maybe my vintage shoes fit perfectly...maybe they're perfectly worn in, perfectly roughed up, perfectly grand for the enviornment and perfectly fantastically great on my feet! 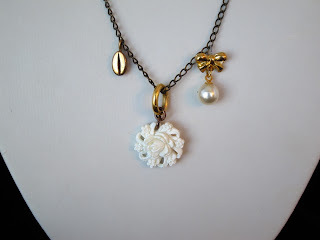 I wonder how much energy I'm saving by upcyling old vintage jewellery into new, like this "Kissable Lips necklace" All the peices on the necklace are taken from an old antique clip on, or crank earring. Making it truly a one -of-a-kind piece! You can check out my other one-of-a-kind vintage reclaimed and recycled pieces at www.GotHattitude.com!